It’s back for its fifth instalment. 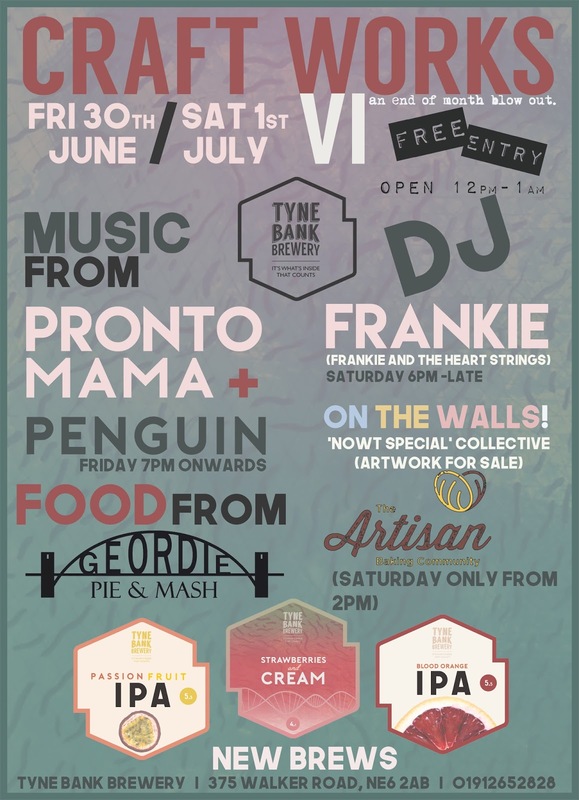 Live Music, Food, DJs, Art and Exclusive New Beers! Friday night we're kicking things off with Live Music from from one of Glasgow's finest bands Pronto Mama with support in the form of local newcomers Penguin! Pronto Mama are a past post-modern bug-eyed beatnik group from Glasgow who are just as confused as anyone else. They are soulful. They believe irreverent wordplay, clean musicianship and a dirty dedication to song-writing is how you do it. Following the release of their anticipated debut album "Any Joy" this is not to be missed. DJ sets on Saturday night come from Frankie (Frankie & the heart strings) taking you throught to the early hours! THREE new beers will be avaible over the weekend! One of which is our June special and returning favourite - Strawberrys & Cream! A luxurious 4.1% pale ale with heaps of fresh strawberries and lactose. Keeping with the fruity theme we'll also be brewing a couple of juicy IPA's with flavours of Blood Orange & Passionfruit! Friday from 4pm we're joined by The Pie Shop! They'll be dishing up an excellent range of local pies with all works - mash, peas and gravy! On Saturday from 2pm we'll be joined by the Artisan Baking Community. They'll be setting up shop and selling a fantastic array of locally produced breads and savoury snacks. Full loaves will be available to purchase as well as snack size foods for those eating in! The Artisan Baking Community is a volunteer led operation that works across communities trying to encourage and include the lesser advantaged in our society. More updates on the products available soon!